In Norse myth and Marvel Comics, a rainbow bridge links Asgard and Earth. 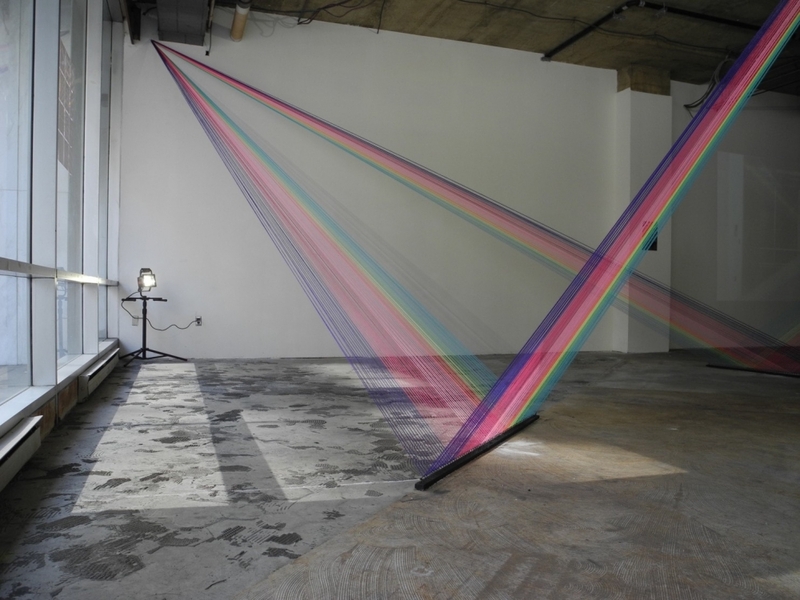 Rainbow fiber bridges have been erected at Hemphill Fine Art’s storefront location at 1700 L St. NW, but they divide rather than connect. Radiating from a center point, the oblique spans of “TOKI Synth Series 005: Reverb” carve the raw space into rooms of a sort. The strings are thin, closely grouped and brightly colored, so their glimmering appearance changes as the light does. Visitors can prowl through the passageways or sit on cushions and savor the synth-soul soundtrack. TOKI is a collective nickname for Toluwalase Rufai and Khai Grubbs, who devised the installation. They’re fledgling architects but also music lovers who invite their guests to write the name of their favorite album on a blank wall. (Some couldn’t stop at one.) The songs TOKI chose to play influenced the piece, Rufai noted, and asking for others’ musical faves expands the collective experience. It’s just one of the ways, he said, “people become part of the artwork.